What hasn’t been said about the new Cayman? It’s a sweetheart of the automotive journalism community, and if you’ve ever been behind the wheel of the covered-roof Boxster, it’s not hard to understand why. With mosquito-like reflexes, a highly versatile powerband and chassis dynamics that rival some of the best in the business, the is an attractive package so highly polished that it feels like something much more expensive. To top it all off, the manual transmission model will muster nearly 30 mpg on the highway and, with two usable trunks, the Cayman is the Swiss Army knife in its highly competitive segment. Released in early 2013 as a 2014 model, this newest Cayman is a clean-slate model that’s done plenty of harvesting from the ‘991’ 911 parts bin. A very tidy design, this newest generation model bares more than a few design cues from the Porsche’s most recent supercar, the 918 Spyder hyper car. It’s hard to find a bad angle of the car, and it’s not only the exterior that has benefited. After you swing open one of the Cayman’s lightweight aluminum doors, you’re met with a handsome and surprisingly spacious interior. The driving position couldn’t be any more ergonomically correct and our 2014 Porsche Cayman S test car’s 14-way Sport seats were a hit, even on long jaunts. While there are several pieces clearly borrowed from its rear-engined kin, this isn’t like the original Boxster of everyone’s memories that was a carbon copy of the 911’s living area. This new car finally gains its own identity. With that said, like all the newest cars from the brand, it now uses the same familiar sloping center console that some might remember from the very memorable Carrera GT super car from 2003. It’s all fairly well thought out, and the control station a tremendous improvement from the previous generation. One negative was the overwhelming amount of buttons and switches in a small area that proved to be a bit challenging to navigate behind the wheel. Thankfully, the newly-designed instrument display features a liquid crystal display on the right-most gauge pod that’s useful and reveals more than you probably wanted to know about the car. With more gizmos than we could begin to wrap our head around, the 2014 Porsche Cayman S is sure to provide hours of entertainment for the individual that enjoys comparing lateral-G loads coming off their favorite off ramp. 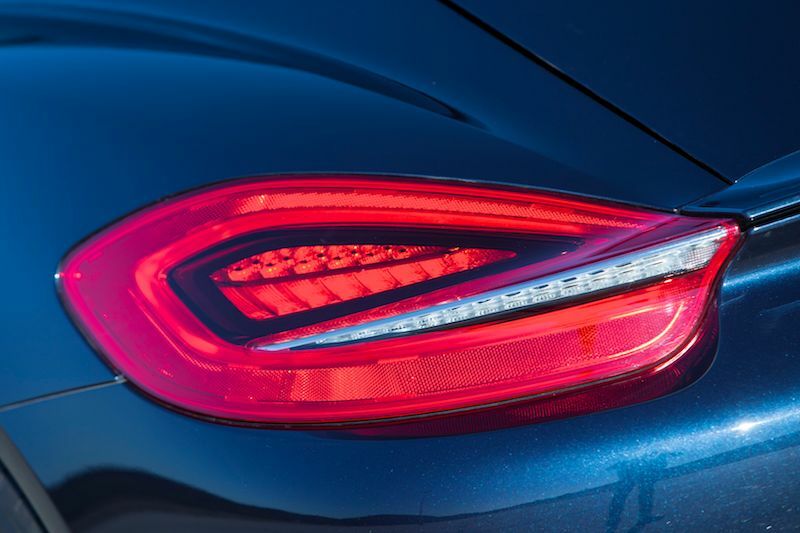 Once you’ve finally shoved the awkward, Panamera-styled key into the ignition, the lovely direct-injected, 3.4-liter flat six of our Cayman S test car barked into life with a much improved exhaust note from its predecessor, despite an engine that’s largely unchanged from the outgoing model. There are two engine choices available, the 2.7-liter of the standard Cayman makes a respectable 275 hp and 213 lb-ft, while the 3.2-liter equipped Cayman S enjoys an additional 50 hp and 59 lb-ft of torque. This engine doesn’t flatter with wild power spikes or outrageous 8,000+ RPM peak power, but it does offer a fantastic aural experience. The Cayman’s engine provides an extremely useful powerband with plenty of low-end and mid-range grunt and power that never falls off, even when the needles sweeps on the red side of its perfectly placed tachometer. We’ve had the opportunity to drive many of the brand’s PDK-equipped models, so it was a welcome change to have one of their slick-shifting manual gearboxes to extract those 325 horses. That isn’t to say we don’t appreciate Porsche’s phenomenal double-clutch, sequential gearbox, but we still very much enjoy the analog driving experience. One useful feature we immediately became fond of with our $88,745 test car was its ‘auto-blipping’ function that automatically blips downshifts with the ‘Sport Plus’ button triggered. It’s a feature that could easily be dismissed as a gimmicky add-on, but is incredibly effective and operates much more smoothly than any human could muster. Those pleased with the original Cayman’s cornering abilities will have a hard time faulting this new car. The first Cayman to utilize the much-maligned electrically-assisted power steering, we found this new car does have a certain amount of ‘fuzziness’ when you first drive away, but after you’ve spent some time becoming acquainted with the car’s slightly more isolated characteristics, it’s not something you would even begin to complain about. Chalk that up to the Sports Car Digest staff being a little too familiar with the unassisted steering from our older fleet. With our PASM (Porsche Active Suspension Management) equipped model, we found that there really isn’t a bad chassis setting to choose from, and like all of its mid-engined family, it never ceases to amaze with its remarkably neutral handling characteristics and high level of grip. The control weights of the Cayman are a subject of serious marvel, and the brake feel and performance was no different. The brake pedal is perfectly placed, while offering more feedback than a YouTube comment section. The level of performance is well beyond what most will discover on the street and is sure to impress even in the most demanding of situations. Our experiences with this new croc were nothing but memorable. There’s rarely a situation where the new car wasn’t a useful tool, and perhaps the most impressive detail in this fantastic package is that through all this extra space, increased refinements and perpetual updates, this newest Cayman still manages to tip the scales at 66 lbs less than the outgoing model. That’s the kind of progress that more manufacturers need to heed. 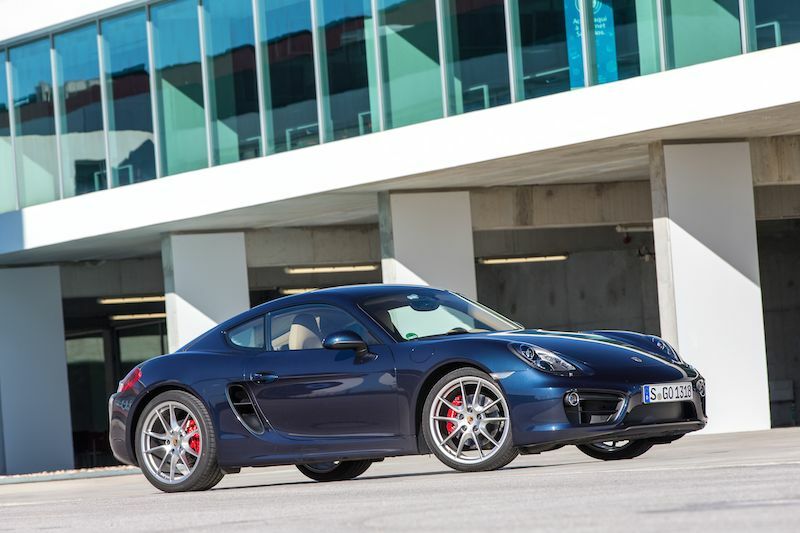 This new 2014 Porsche Cayman S gets our respect. We’ll take ours in Carrara White with that sweet, $2,825 Sport Exhaust system. My “ticket me Red” S just celebrated it’s First Anniversary. What a fantastic machine! At 84K is has most everything a person could dream, except for the exhaust. I’ve gotten 32mpg on the highway and 14mpg at Road America. It has done everything I asked with ease. I can’t wait to try the new GTS but I guess I have to buy one to take it on the track. In the meantime, this is exciting to drive, even around town.